This NebGuide provides information about voles, the damage they cause, and ways to prevent and control damage problems. Voles are small, mouse-like rodents that exist throughout Nebraska. Though commonly called meadow or field mice, their short tails (about 1 inch long), stocky build, and small eyes distinguish them from true mice (Figure 1). Voles can cause problems by damaging lawns, gardens, tree plantings, and other plants. 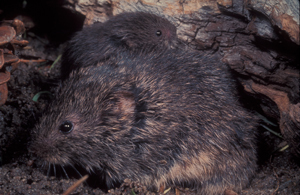 The prairie vole (Microtus ochrogaster), the most common species, occurs statewide. Meadow voles (Microtus pennsylvanicus) also are very common but cover a slightly smaller geographical area. Pine voles, or woodland voles (Microtus pinetorum), generally are confined to the southeastern edge of Nebraska along the Missouri river. Voles are small with adults weighing 1 to 2 ounces. Their overall adult body length varies from 4½ to 7 inches in the meadow and prairie voles, to about 3 to 5½ inches in the pine vole. The three species of voles in Nebraska differ in color, general size, and relative length of tail, but it usually isn’t necessary to distinguish between the species to control the damage they cause. Voles are an important source of food for many predators, including snakes, hawks, owls, coyotes, weasels, foxes, mink, and badgers. Mortality rates for voles are very high. Life expectancy in the wild often does not exceed 2 months, with few living longer than 16 months. The breeding season for all voles encompasses most of the year with peaks occurring in the spring and fall. Prairie and meadow voles normally have 5 to 10 litters per year, averaging 3 to 5 young per litter. Pine voles have 1 to 6 litters per year and average 2 to 4 young per litter. Vole gestation lasts about 21 days. One captive meadow vole raised 17 litters in one year, totaling 83 young. A female from that first litter had 13 litters, totaling 78 young before turning 1 year old. Vole populations often are cyclic and can increase from 10 to 250 voles per acre. In North America, vole populations peak about every four years. These cycles are not necessarily regular or coupled with dramatic increases in numbers. Occasionally, high vole populations last about a year before crashing. These peaks occasionally result in severe damage to crops and landscapes. Prairie and meadow voles inhabit pastures, roadsides, alfalfa fields, and other grassy or weedy sites. Preferred habitats include areas with fairly dense ground vegetation. Meadow voles are more common in low, moist areas or upland sites near water. Pine voles inhabit timbered areas, preferring a life underground. They can thrive under forest litter, however, and in fields surrounding timber stands, provided enough ground cover is present. Figure 2. Voles can severely damage or kill small trees. Figure 3. Surface runway system of the prairie vole. Photo by Stephen M. Vantassel. Vole damage is costliest during the winter when a shortage of preferable foods forces them to eat the inner green layers of bark of trees and shrubs. 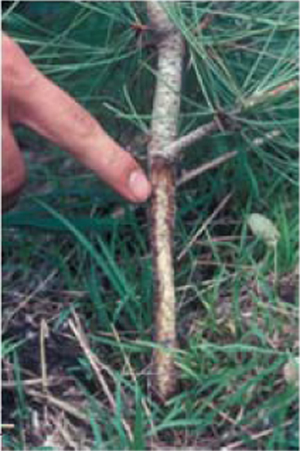 The gnawing required to reach this layer can severely damage or kill many young trees and shrubs, including orchard, windbreak, and landscape plantings (Figure 2). Voles cause damage to field and forage crops, especially during spring when young plants are emerging from the soil. Voles clip off the young plants and dig up the seeds, sometimes causing significant reductions in stand density. Voles can damage or consume flower bulbs, garden plants, vegetables, and field and forage crops. Voles can scar lawns by constructing runways and clipping grass very close to the roots. 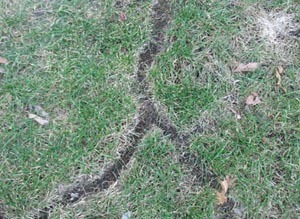 Though the damage done usually is not permanent, it may detract from the appearance of a well-kept lawn. They also eat leaves, shoots, roots, tubers, and seeds of most grasses and broad-leaved plants. Their damage may be severe enough to prevent self-seeding of annual landscape plantings. Signs found at the scene will help you identify the species causing damage. Prairie and meadow voles leave characteristic surface runways that are visible after snowmelt (Figure 3). The runways consist of closely clipped vegetation, about 1 to 2 inches wide. Small holes lead to underground runways and nesting areas. Pine voles have extensive underground burrow systems, and spend little time above the leaf litter and ground cover layer. Damage that is primarily underground (versus aboveground), coupled with the absence of surface runway systems, typically is caused by pine voles. Voles usually damage woody plants during late fall through early spring. Voles tunnel through snow, and may gnaw on trees and shrubs up to the height that snow accumulates. Individual tooth marks (about 1/16-inch wide and approximately ⅜-inch long) may be visible on the wood after winter vole damage. The gnawing marks left by voles will be irregular in appearance and at various angles. In contrast, rabbits leave tooth marks that are about ⅛-inch wide and very regular. Pine voles, and occasionally meadow and prairie voles, tunnel belowground and feed on roots of trees and shrubs. Voles have been known to travel in tunnels developed by moles to gain access to flower bulbs and other plant roots. Damage of this type often is mistakenly blamed on moles. Moles feed on insects and earthworms and rarely consume plant materials. Voles don’t always cause significant damage to property. Populations of voles, however, can increase quickly and be cause for concern. Generally, a direct relationship exists between populations of voles and the expected overall level of damage. Before undertaking control, consider the extent of the problem in relation to the cost of control. For example, a few voles could damage a highly valued tree or flower bed and warrant control. At other times, they may go virtually unnoticed, making control unnecessary. Usually, it is more cost-effective to respond quickly to signs of damage than to wait until damage becomes severe. Reduce the suitability of habitat for voles to lessen the likelihood of future damage. High vole populations cannot become established without food and protection from predators. Grass and weeds can be controlled around young trees and shrubs through cultivation, herbicides, and mowing. Normal cultural practices employed in establishing windbreaks, orchards, and other woody plantings often are effective in reducing habitat and potentially high populations of voles. Unfortunately, voles often thrive under plastic weed barriers laid on the ground to control weeds around shrub and tree plantings, requiring the use of other control methods. Remove bird feeders or substantially reduce spillage from feeders to help lower the availability of food for voles. Although drastic, voles are less likely to traverse weed-free zones that are 15 feet wide. Voles from adjacent areas, however, may use the cover of snow to invade even the best manicured property. Although habitat modification is critically important to reduce vole damage, it often is not enough to end vole damage near woody plantings. Exclusion can be used to protect highly valued flower beds, gardens, shrubs, and trees from vole damage. Install woven-wire or hardware cloth fences (¼-inch or smaller mesh) around small flower beds or gardens to reduce the access of voles to such areas. The fence should be about 12 inches high and the bottom should be buried 2 to 3 inches in the ground. Where pine voles are a problem, the fence should extend about 6 inches belowground as well. Rabbits and ground squirrels also will be excluded if you make the fence 18 inches tall and bury it in the soil a few inches. Figure 4. A plastic cylinder (above) or cylinder of hardware cloth or other wire mesh will protect trees and shrubs from vole damage. Photo by Stephen M. Vantassel. 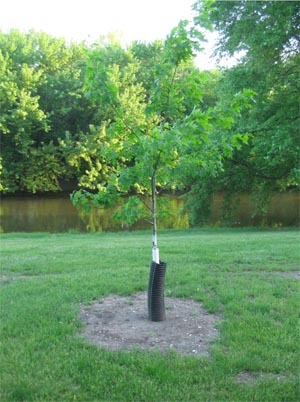 Use ¼-inch hardware cloth or plastic cylinders to protect individual trees and shrubs (Figure 4). Again, the cylinder should be tight to the ground or buried slightly and should extend higher than the maximum depth of snow in winter, including drifts. The height of the cylinder should be at least 18 inches above the snow depth, if possible, where rabbits are a potential problem also. When making the cylinder, overlap the edges at least 1 inch and fasten securely so gaps do not form that could enable voles to enter. Cylinders of galvanized hardware cloth should last about five years, so make them large enough in diameter to accommodate expected trunk growth if they remain in place during the growing season. Cover the tops of the tubes to prevent the entrapment of cavity-nesting birds. Repellents made with thiram and capsaicin are registered for controlling vole damage on ornamental plants. They are not registered for use on gardens or plant parts destined for human consumption. Coyote and fox urine may help to disperse voles and have been proven to increase stress and, therefore, reduce reproduction in voles. Wear waterproof gloves and avoid contact with urines as they may not be sterile. Repellents are relatively expensive and provide only short-term protection. Precipitation may wash some off. When foods are in short supply, such as in winter, the effectiveness of repellents usually decreases. Avoid using electronic repellent devices, moth balls, or other unregistered products as no evidence has been produced regarding their effectiveness on voles. Trapping is an effective method for controlling voles, if the damage is over a limited area (less than an acre) and a sufficient number of traps are used (two to three per runway and/or hole). Set single mouse snap traps perpendicular to vole runways with the triggers in the runways, or set two traps together within the runways with the triggers facing away from each other (Figure 5). Bait is not required. If you prefer to use bait, smear peanut butter mixed with oatmeal on trap triggers. 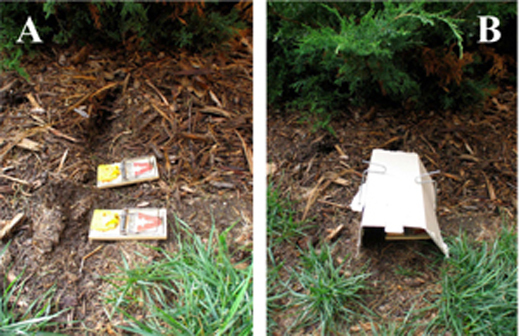 Baited traps should be covered with a box with a 1-inch hole cut in it, to reduce attractiveness and access to birds and squirrels. Make sure boxes are securely positioned and of sufficient size to allow free action of the snap traps. Good enclosures can be made of PVC pipe and cardboard milk cartons. Figure 5. A) Two traps set before covering. B) Traps set in a run with cover. Wires hold cover in place. Photos by Stephen M. Vantassel. Multiple-catch mouse traps also have been useful in catching voles, especially meadow and prairie voles. Since several voles can be captured at one time, fewer traps are needed. Another advantage is nontarget animals such as shrews can be released. Locate traps near visible burrows and adjacent to vole trails. Place a small amount of seed material, either bird or grass, at both entrance points. If the location is correct, traps should contain a few voles in 24 hours. If you catch nothing after two nights of fair weather, move the traps to a new location. Large vole populations can be reduced most efficiently with toxic baits. Be sure to read all pesticide product labels thoroughly and comply with all directions given as “The Label is the Law.” Toxic baits are classified as General Use Pesticides (GUP) or Restricted Use Pesticides (RUP). General Use Pesticides may be purchased without a pesticide applicator’s license. Restricted Use Pesticides may be purchased and used by Certified Pesticide Applicators only. Contact your local UNL Pesticide Education Office, http://pested.unl.edu, (800-627-7216) for information on becoming a Certified Pesticide Applicator. In June 2011, the Environmental Protection Agency established additional restrictions to the public’s access and use of rodent baits to reduce the risk baits pose to children and nontarget species. Baits are most effective when applied in the fall through early spring when voles have few alternative sources of food. Warfarin is the only active ingredient available as a GUP for voles. Since voles must feed on the bait three times to receive a lethal dose, it is essential that bait stations have a sufficient supply of bait. Check stations every other day in the early days of control. Failure to keep stations full can result in sub-lethal dosing and subsequent bait avoidance. Chorophacinone is a RUP that, like warfarin, requires multiple feedings to cause death. Follow the same practices as noted with warfarin. Zinc phosphide is a RUP that can kill voles with a single feeding. Since zinc phosphide has a bitter taste, it is advisable to pre-bait with untreated oats or pellets for two to three days to improve bait acceptance. To reduce the potential of affecting nontarget species, avoid placing prebait or toxicant on bare soil or in piles. Use zinc phosphide during a period of fair weather to protect the toxicant from moisture. Use bait stations to further decrease the risk of nontarget species and moisture from reaching the toxicant. See the NebGuide G1646, Bait Stations for Controlling Rats and Mice for more information about bait stations. Zinc phosphide baits can be applied by hand in runways or burrow openings. In urban noncrop areas, zinc phosphide can only be applied in bait stations or by hand-baiting. When placing toxicant in holes created by pine voles, take care not to damage the hole or surrounding area. Pine voles are very fastidious. Any disturbance may result in the pine vole “sweeping” the toxicant out of the burrow during its cleaning activities. Toxic bait also may be broadcast according to label directions. This technique is most appropriate in young woody plantings or orchards, when efforts to reduce habitat have failed to reduce populations of voles. Note that broadcasting increases the amount of bait applied per acre as well as the risk of harm to nontarget wildlife. Before baiting, mow the grass to increase the amount of bait that reaches the trails and burrows used by voles. Zinc phosphide pellets also are registered for in-furrow applications when planting corn or soybeans in minimum tillage systems. Specialized application equipment is required. Contact your local extension educator for more information. Gas cartridges and aluminum phosphide tablets may be used to fumigate vole tunnels. Fumigation is very time consuming and often not very effective due to the complexity of vole tunnels. Aluminum phosphide is a Restricted Use Pesticide. Use of propane-oxygen exploding devices is illegal in Nebraska. Use pesticides safely. All toxicants and fumigants used to control voles can be hazardous to humans, pets, livestock, and nontarget wildlife if used improperly. Only use products that are registered for voles by the U.S. Environmental Protection Agency. Read pesticide product labels carefully and comply with all directions given. Seek assistance from your local extension educator, if necessary. Voles are not known to be a significant threat to human health and safety. Nevertheless, voles have been implicated in the transmission of tularemia and have been known to be hosts for agents of other infectious diseases, such as babesiosis, Lyme disease, giardia, and Rocky Mountain Spotted Fever. Reduce the risk of contracting diseases by wearing gloves, washing hands, using insect repellent, and avoiding contact with voles, including their urine and feces. As in most situations with vertebrate pests, a combination of methods may be more effective than relying on any one method for controlling vole damage. Most problems with voles in urban and backyard areas probably involve small populations of voles that can be controlled with habitat modifications, fencing or exclusion, trapping, and repellents. Nonurban damage situations may involve larger populations of voles over greater areas, and can be dealt with by habitat modification, repellents, and toxic baits, when necessary. Property owners should continue to monitor plants and soils for new vole activity. Bait stations filled with nontoxic baits also can be employed as monitoring sentinels. Given their incredible reproductive rate, new infestations can seem to appear overnight. A quick and appropriate response to new vole damage can significantly reduce the amount of effort and associated costs needed to control the problem. More information can be found at http://icwdm.org or from your extension educator. Reference to commercial products or trade names is made with the understanding that no discrimination is intended of those not mentioned and no endorsement by University of Nebraska–Lincoln Extension is implied for those mentioned. Visit the University of Nebraska–Lincoln Extension Publications website for more publications.